UMPD and Miss UM helped educate the University of Miami’s student body about the importance of practicing safe driving at the safety fair Thursday afternoon on the Rock. The safety fair, which included educational games and information, focused on the topics of alcohol and texting. Distracted driving is defined as the practice of driving a motor vehicle while engaged in other activities, such as the use of a cellular device. According to distraction.gov, distracted driving is considered an epidemic. In 2012, there were 3,328 distracted drivers killed in car crashes. The likelihood of crashing while texting and driving is 23 times more than non-distracted driving. “It’s that one time you look down for a few seconds and you don’t get a second chance,” Gulla said. On Oct. 1, 2013, texting while driving became a secondary offense in Florida. A secondary offense means that a driver can only receive a citation if he or she is pulled over for a separate traffic violation that is considered a primary offense, such as speeding or running a red light. 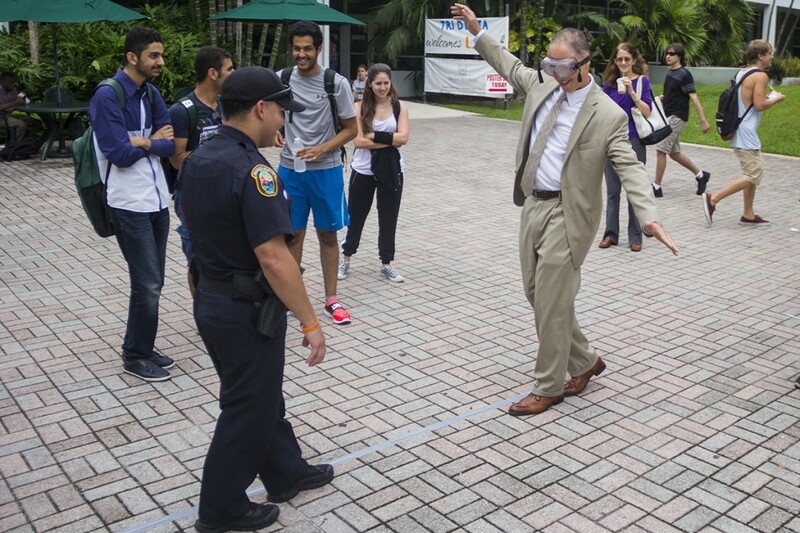 Along with the numerous informational brochures, the safety fair sponsored games to help educate the student body. A simulated driving game allowed people to experience what driving would look and feel like while intoxicated or distracted. Students were also able to watch a crash dummy inside a plastic vehicle that simulated the outcome of various types of car accidents. Students seemed most enthused, however, to try the special goggles and attempt walking a straight line while “under the influence.” The goggles came in different levels of drunkenness, including one to represent four beers and one to represent 10. “I think it’s informative and it puts things in perspective about how much you have to drink to be able to walk,” said Jordan Brensilber, a senior majoring in marketing and management. The safety fair did not only focus on distracted driving or driving under the influence. Making smart choices as a driver and pedestrian were also big topics. Amber Butler, Miss University of Miami 2014, was in a head-on car accident at age 16. After her accident, Butler started up her own organization called Responsible and Educated Drivers (RED). This year’s safety fair was a part of the “Put it Down” campaign, which was started in 2011 to educate younger students about the dangers of distracted driving. AT&T, as well as other cell phone carriers, offer apps like “DriveOff” that prevent distracted driving by shutting off apps while the car is in motion. Other organizations that tabled at the event were Mothers Against Drunk Driving, the Dori Slosberg Foundation, AAA and 1800234ride.com, which is a service that promotes alternative modes to school, as well as various departments of security and transportation safety.